Ferreteria Maderas 3C, is a full service lumber yard and home improvement center in Puerto Rico stocking one of the largest variety of woods in the world. Maderas translates to wood and in addition to a full service ACE hardware store on site they have a fully stocked lumber yard with an amazing inventory from Teak, Mahogany, Poplar, Maple, White Oak, Red Oak, Cedar, Cypress, Ash to many other species. They also have the greatest variety in doors of the Caribbean with more than 100 models to choose from which are all manufactured in either their facility in Puerto Rico or their second location in Ecuador. This mega operation was started by Mr. Cuebas with his sons now running this facility serving all of Puerto Rico as well as the neighboring Virgin Islands. 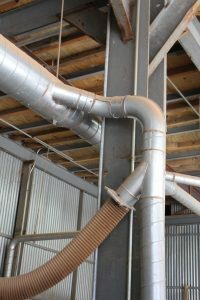 With a full woodworking facility on premise they need a powerful dust collection system to meet their growing needs. Jorge Cuebas oversees, among other things, the manufacturing department and with the guidance of long time family friend, fellow woodworker and Air Handling Systems Customer, Bertyl Ramirez, he manages the dust collection system on the property. Bertyl has been purchasing from Air Handling Systems since 2001 and when Jorge needed help with the growth and expansion at Maderas 3C he called on Bertyl. Starting in 2009 with the first dust collection system Bertyl has been providing technical support for the latest expansion. 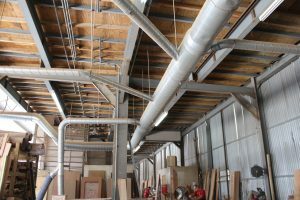 Earlier this year we shipped six pallets of ductwork, including spiral pipe, fittings and flexible hose from 3”-16” in diameter for their expanding dust collection system.